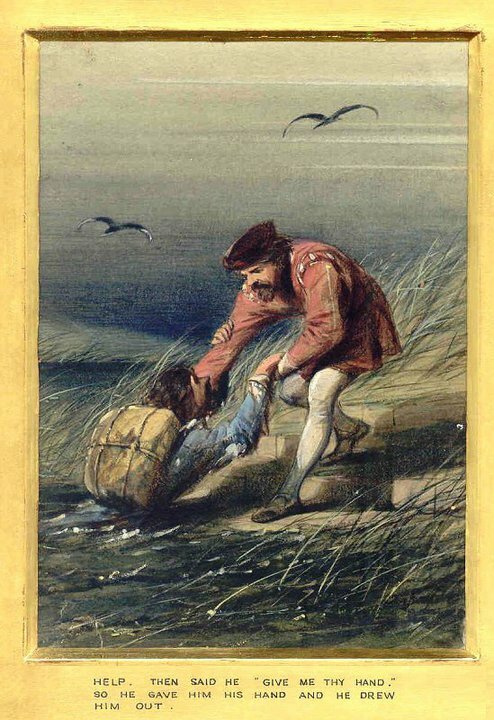 In John Bunyan’s, The Pilgrim’s Progress, the main character CHRISTIAN slips into a miry bog called The Slough of Despond. CHRISTIAN struggles in the mire for a little while and then HELP comes. “But why did you not look for the steps?” HELP asks. HELP extends his hand, draws him out, sets him on solid ground, and sends him on his way. We’ve all passed through the Slough of Despond. Maybe you are passing through now. Poor CHRISTIAN. In his fear and anxiety he could not see right. Isn’t there a propensity to grow so weary and faint under the weight of our own trials and afflictions that we lose sight of Jesus? Isn’t there a proneness in the best of us to lose the eyes of our faith? One word comes to mind, “Real” simply real. We’ve all been there no doubt. I’m reminded of the wise counsel our first pastor gave us almost 30 years ago about depression. He noted that most depression is self-focused and one of the best ways to get out of it (slough of despond) is to find someone in need and meet that need. By refocusing on others we heal ourselves. Praying for all the saints is a great place to find HELP in our depression. Moreover, prayer is part of the armor in spiritual warfare. “And pray in the Spirit on all occasions with all kinds of prayers and requests. With this in mind, be alert and always keep on praying for all the Lord’s people.” (Eph. 6:18). I shared this blog with all my friends. We live in a dismal world. Why when, you hear the news and the world seems upside down. I see so many people in economical distress the world on the brink of self destruction. Indeed this is a time a for us the believers to raise our trumpets-of prayers and remind ourselves that the Lord is the only provider, and defender and ruler of the universe. Therefore I rest my faith under his umbrella and not mankind. Thank You for the reminder.